"There are 19 members present and we received 19 ticks," said Speaker of the House of Assembly Alix Boyd-Knights. "So I have to declare that Charles Savarin has been elected to be the next President of Dominica." Speaker Boyd-Knights spoke at the end of a one-hour meeting of the Dominica House of Assembly on Monday morning during which the government's members of parliament voted for their nominee, Charles Savarin, for the post of Head of State. Three elected members of Parliament were absent. They were: Ian Douglas (Parliamentary Representative for Portsmouth); Julius Timothy (Parliamentary Representative for Roseau North) and Ronald Toulon (Parliamentary Representative for Colihaut). The opposition United Workers Party (UWP) boycotted this sitting of the House. In a statement to Parliament just before the vote to elect Savarin, Prime Minister Roosevelt Skerrit said contrary to the opposition's views there was nothing illegal about the election of his nominee to the Presidency. On Wednesday last week Savarin accepted the Government's nomination and subsequently resigned as Senator as well as the Minister for National Security. But the UWP has been against the election of Savarin as the new President to replace His Excellency Eliud Williams whose term ends today. "The planned election of Charles Savarin as President is not acceptable to the people of Dominica", Lennox Linton, the new UWP political leader told supporters at a rally at Londonderry on Sunday. Linton said a President is supposed to be a non-party representative and the embodiment of the State and Savarin does not fit the role. "Charles Savarin is cantankerous and a divisive mercenary of the ruling party," Linton said. "He cannot be the non-party representative of the nation as a whole." 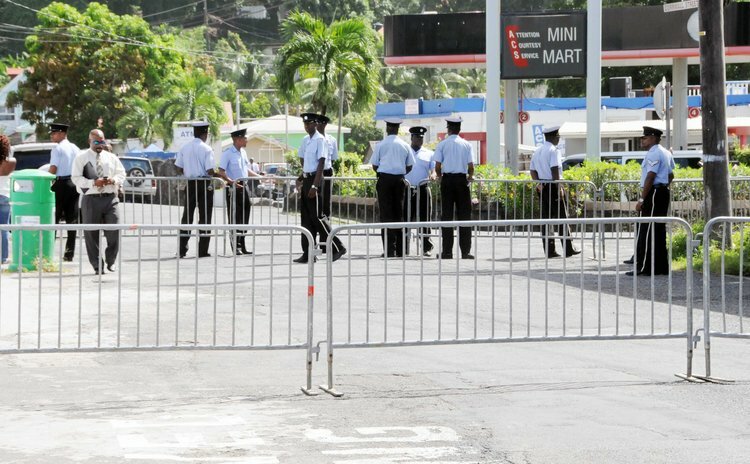 The Skerrit administration anticipated trouble this morning and deployed dozens of police officers to direct pedestrians around erected barricades on Victoria Street and neat the House of Assembly. The UWP has asked supporters to gather at 5.00 pm outside parliament today for what it calls a peaceful meeting. Savarin is the Skerrit Administration's third nominee for the post of Head of State. The other nominees have been Speaker of the House, Alix Boyd-Knights, who withdrew following public protest; the second nominee was retired civil servant Jennifer Wallace-Lafond who also withdrew her nomination for personal reasons. Criticising the UWP's lack of decisiveness on the matter Skerrit said in Parliament this morning that the opposition had enough time to suggest their nominee. "They never put forward a name," he said. "They waited deliberately and calculatedly for the expiration of the period as provided by the Constitution to be over to say they had somebody." Skerrit added that all the opposition had to do was "write to the Speaker if you want to get consensus between the government and yourself about the two candidates, put forward a name and then we can talk. We cannot bend the Constitution to our own will, we have no such authority." Skerrit continued: "It's a campaign of misinformation, deliberate misinformation, Madame Speaker; an attempt to mislead and seek to have violence in the country on a matter which there ought not to be any form of violence." Savarin is expected to be sworn in as President on Wednesday, October 2nd at 11 am.